Active Components: Isoquinoline alkaloids, such as a- and b-allocryptopine, sanguinarine (nearly 1%), sanguirubine, chelerythrine, sanguidimerine, sanguidaridine, protopine, oxysanguinaridine, chelilutine, sanguilutine, coptisine, berberine, and so on. Used For: The remedy is used to boost expectoration, relieve spasms, induce vomiting, relieve constipation, treat heart conditions, and cause local irritation. 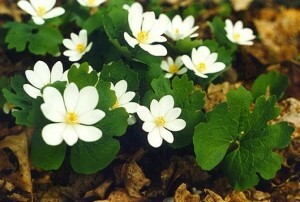 Blood root is primarily applied for bronchitis. Though being a triggering agent with regard to its expectorative and emetic capacity, it is an effective relaxant for chest muscles. Consequently, it can also be used in laryngitis, croup and asthma therapy. However, its key capacity consists in treating recurrent congestive diseases of pulmonary origin, like recurrent bronchitis, bronchiecstasis, and emphysema. Additionally, it stimulates blood circulation in the peripheral area. To treat nasal polyps, blood root may be used as an inhalant. Additional Info: Being indigenous to Canada and North America, blood root belongs to perennials and can reach only 6 inches in height. The rhizome produces red juice in fresh condition, and when dry, it’s brown-colored on the surface and yellow inside. The leaves are cordate and located close to the ground. The flower is white-colored. Preparation and Intake: For a decoction take one teaspoon of the rootstock for a cup of water (cold), boil it up and let stand for ten minutes. The result is taken thrice a day. In form of tincture the plant is used in a quantity of 1-2 ml thrice a day. Commonly mixed with Elecampane and Horehound to relieve congestive diseases. To treat pharyngitis the remedy is used together with Cayenne and Red Sage. Safety: Large quantities cause inhibition in body functions and can even lead to death. Not suggested to use without proper medical control.